I’ve done four articles so far on gun policy since Parkland, and this is the first one to use the word “Parkland.” In that time I have not watched a single thing David Hogg, Emma Gonzalez, or their conservative counterpart Kyle Kushuv have had to say on the issue. Not once. Not even by accident. Students killed per million students. Their article, which should be required reading, expounds on research from James Alan Fox, a professor of Criminology, Law, and Public Policy at Northeastern. 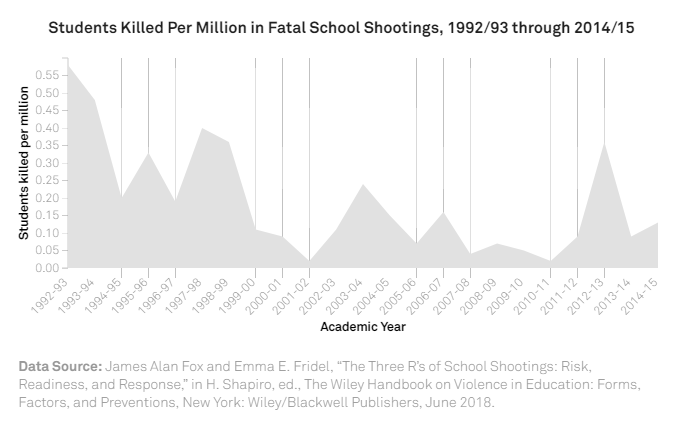 Specifically, they cite data showing that around ten children per year are killed by gunfire at school, out of a pool of approximately 55 million students, for an annual rate of 0.000018%. Let’s try to visualize that. Alternately, let’s do a hipster analogy. Pretend you are tasked with drinking one beer per death in the United States, and each beer you drink is a different flavor based on how that person died. “School Shooting” is obviously milk stout, because why not. You started drinking right now, one beer per dead person, one hour per beer, twelve hours per day, with no vacation and no breaks. You would have to drink beer for almost 60 years straight before you drank your first milk stout, by averages. “You’re cheating, Mr. Author sir, you included all deaths, not just firearm deaths.” OK. If we limit it purely to gun deaths, you’d drink twelve beers per day for about eight and a half months before you drank your first milk stout. Pretending gun suicides are Pabst Blue Ribbon, you’d be drinking eight of those a day. That’s the relative magnitude of the numbers we’re talking about. School shootings are the closest thing in the gun policy sphere you can get to a freak act of nature. They’re rarer than many actual freak acts of nature. Which makes it completely ridiculous to assign any value to anything a witness to the Parkland shooting says about gun policy, whether they’re anti-gun or pro-gun. They were first-hand witnesses to a very traumatic, very terrible freak occurrence. That’s not to say I don’t sympathize with them. I do. I can only imagine how distressing that situation must have been. The whole thing was horrible. But that’s all the more reason not to frame policy around anything anyone in that building, on either side of the debate, has to say. They are likely not objective. They are likely impassioned, and rightfully so. But good policy should be based on reason, not passion. If a villager in Nepal gets his family eaten by a Bengal Tiger, that does not automatically qualify him to be the game warden. In fact, it may explicitly disqualify him. His public speech regarding the danger of tigers should not be quelled, nor should it be sought for its wisdom when he advocates Nepalese Tiger-cide. There may very well be students from Parkland who are capable of a deep understanding of the complexities of US gun policy. It is a broad and difficult topic, but it is certainly possible. But even if there were such individuals, their personal experiences would almost surely prevent them from being able to form an objective opinion on the issue. Presuming we wanted high school students to weigh in on the national gun conversation, Parkland would be the worst possible place to find someone objective and dispassionate enough to approach the issue logically. Find a kid from Tampa or something. Find ten. Preferably black males, since they’re the ones at the tip of the spear as far as gun homicide goes. Even though I’ve avoided watching most of the circus, I did run across a bit of a policy manifesto for the March. I don’t object to people marching. I think it’s healthy. But presuming that the face of the march is in some way associated with the policy copy, it raises some concerns with me. For instance, the manifesto includes the usual mag size restriction suggestion. High-capacity magazines that hold more than 10 rounds serve only one purpose — to allow someone to shoot as many bullets as possible, in the shortest amount of time. These magazines are devastating and need to be banned. How many kids would have died if the shooter, whose name I haven’t even bothered to look up yet, used 10-round magazines instead of 30 round magazines? Let’s do math. He fired 150 rounds over the course of seven minutes, and swapped out five 30 round magazines. Give him three seconds per mag, which is on the slow side, and he spent 15 seconds reloading and 405 seconds shooting, firing a round every 2.7 seconds on average. 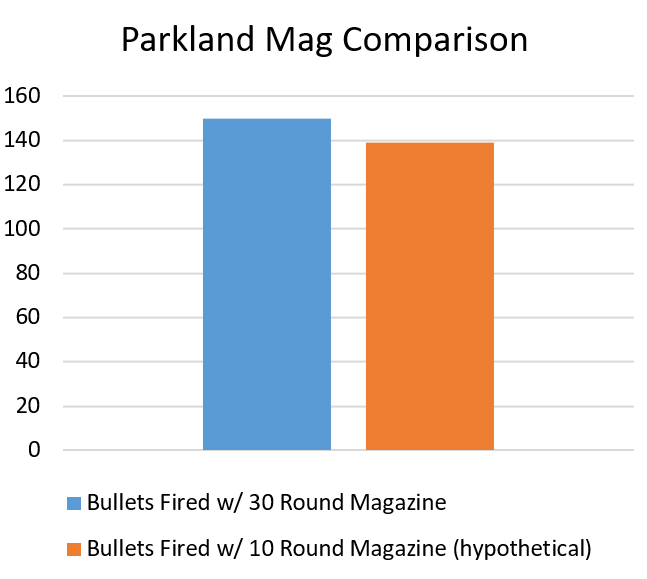 If he were limited to 10 round mags he would have had to reload three times as much, spending another 30 seconds on reloading, and he would have fired 11 less rounds out of his 150. A 7% difference, that he easily could have made up by simply ending his rampage half a minute later. So we have a policy proposal on the table to make every 30 round magazine in the country illegal, on the presumption that mass shooters would follow that law, in order to reduce the number of rounds fired in this hypothetical “mag law-abiding mass school shooting” by 7%, and save one kid. What happens after the next school shooting, where let’s say 20 people die? Do we throw a party celebrating that it wasn’t 21, due to our sweeping magazine reform? This is just silly, from a policy standpoint, because the policy is broad, difficult, impacts a tremendous number of lives, and has no significant or verifiable efficacy. Why do we arrive at such silly policies? The people who concoct the policies seem to think that if the shooter couldn’t find a 30 round magazine, he would have stayed at home playing X-Box. I doubt that. We could do the same math for Sandy Hook and discover he would have shot 12 fewer rounds out of 154 using ten round magazines. The profile of most of these school-shooter instances is similar. The graph would look about the same. It’s also worth noting, that a ban on magazines over 10 rounds would make every pistol carried by every police officer in the country illegal, as well as most pistols bought for home defense. The March’s policy manifesto also has the “Ban AR-15s” language in it. How many kids would have died if he walked in with a pair of pistols and a backpack full of magazines? Pistol rounds are not as deadly as rifle rounds, but pistol shootings can go on quite a bit longer because the pistol is concealable. The stats on mortality ratio during mass shooting events are all over the place. Parkland (rifle) had 17 dead, 17 wounded, for a mortality ratio of 50%. Sandy Hook (rifle) had 27 dead 2 wounded, for a ratio of 93%. Virginia Tech, which was done with a pair of pistols, had 32 dead and 17 wounded, for a mortality ratio of 65%. There’s also the very important fact that rifles only make up 0.7% of gun deaths, but we’ve already covered that. There is no question, in terms of ballistic science, that a typical rifle round is deadlier than a typical pistol round. But that mortality disparity only matters during a running gunfight. It’s not clear at all that the power of the firearm matters in these sitting-duck shooting-gallery instances. There are serious questions of efficacy here that nobody seems to dwell on. Honestly I don’t dwell on them much either, but that’s because I realize that school shootings aren’t worth dwelling on at all. Three people die per hour to firearms in the United States. The rest of the country left the Parkland shooting behind six hours after it happened. If we want to have an honest, data driven discussion about gun policy, we need to do the same. Awesome article series on gun control! Love the data driven approach and I’m sure you put a lot of time and effort into writing each post. So I just wanted to thank you for posting them.